Overview : This Extended Power Li-ion battery is a great companion for PSP. A great solution for long time flights, hikes, and anytime you don't have to access to an AC outlet. With this external battery, you can now prolong your fun with extended game play, music play and playback anytime and anywhere you want. Built in Japan made high quality 2100ma rechargeable Li-ion battery - supplies power for 10 hours (including the original battery). No need to buy the extra charger - just use the official PSP power supply or USB power cable for recharging. Super small size & light weight (80g). Easy to fit by the side of the console. 3 colors available - black, white or silver. Quality/Usability : There are so many extended battery packs available for the PSP, whether it is a bigger mAh sized battery or battery packs that attaches or dangles from the PSP. The PSP Deluxe Extended Power Battery attaches to the bottom of the PSP. There is hook on the left side of the PSP Deluxe Extended Power Battery and a latch on the right side. Also on the right side is the charging terminal where you would insert the AC adaptor. On the bottom of the battery pack is a green LED. This is turned on when it is charging. Inserting the battery pack is fairly easy. 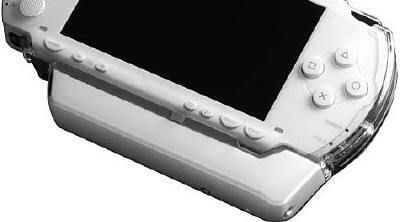 Simply take the hook on the left side and place it through the strap holder on the PSP. Then slide the battery up, so that the clear latch attaches to the right side of the PSP. You'll hear a click. This is to let you know that it is locked in place. To remove, simply pull back on the clear latch so it comes off the PSP and unhook from the strap holder on the PSP. Charging takes about 2 hours to fully charge. On a full charge and a completely dead PSP, the PSP Deluxe Extended Power Battery can charge the PSPs batter to about 80%. It doesnt completely charge the PSPs battery. With a full charged battery pack and fully charged PSP battery, I get about 10-11 hours. Conclusion : Overall, the PSP Deluxe Extended Power Battery works nice and gives the PSP a good amount of play time. Only complaint is that the clear latch feels a bit cheap and feels like it will break if you pull back too far. Also, since the PSP Deluxe Extended Power Battery extends the bottom of the PSP, it may feel a little awkward since you're hand is use to wrapping around the PSP. Price is a bit pricey as well. Guests online: 450. Total online: 451.